I’m a Minnesotan and I’m not ashamed to admit it except, of course, when we manage to elect wrestlers, comedians, and other wackos to high-ranking public office. A typical Minnesotan will spend a great deal of time agonizing over the extremes in weather we choose to endure, refer to carbonated beverages as pop rather than soda, and measure distance in terms of hours rather than miles. Minnesotans are also an exceedingly provincial lot. The surgical precision with which the Twin Cities media will dig to unearth the tiniest detail linking a national story to a local angle is nothing short of remarkable. Furthermore, no state’s residents love to hear their homeland mentioned by the national media more than Minnesota’s. But even the state’s most ardent “homers” would prefer that one of Minnesota’s most internationally recognized events in its history had never required any airtime on CNN or the like. 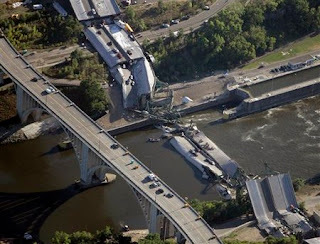 Today marks the fifth anniversary of the Interstate 35W Bridge collapse into the Mississippi River near downtown Minneapolis which killed 13 and injured 145 unsuspecting drivers, passengers, and construction workers in the waning moments of the evening rush hour. Minnesota was on the map in the days and weeks ahead, but for all the wrong reasons. Since I’m already a local, that angle is already well established. However, I do have a personal angle to offer; one that puts me and my family near the scene. Close enough, in fact, that in the years since the collapse I've often wondered what might have been if not for fate’s curious and auspicious intercession. The afternoon of August 1, 2007, was a day much like today in that it was a sunny Wednesday with high temperatures hovering around 90 degrees. My wife’s brother, a long-time Minnesota Twins season-ticket holder, had graciously offered my family his four tickets to that night’s game at the Metrodome where the Twins were set to host the Kansas City Royals. My routine for outings like this with my family generally involves arriving downtown roughly an hour ahead of game time to get parked, get in the building, load up on food, and settle into our seats. Game time was 7:10 pm. The bridge fell at 6:05 pm. Issues at work late that afternoon left me a few minutes behind my schedule and a tad frustrated that my routine might be affected. It’s not a trait I’m proud of, but I do allow things like that to affect me more than I should. Being that as it may, I of course wanted nothing more to get back and remain on schedule. A good friend of mine is the Concession Department Manager for Centerplate, the company which operates the Metrodome’s concession stands, and, as it happens, I had spoken with her earlier that day. 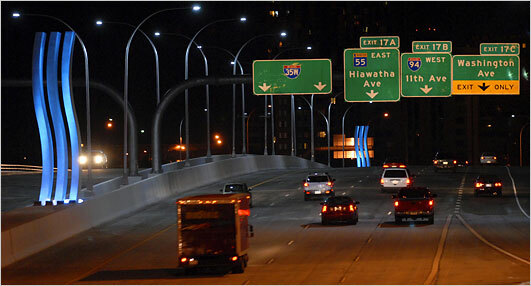 In our conversation she had mentioned that I might want to be wary of the construction occurring on the bridge and the traffic backups, in addition to normal game traffic, we may encounter as my route to downtown Minneapolis from the northeast suburbs of the Twin Cites takes me over the I-35W Bridge. With that in mind, and already overly concerned with maintaining my rigid itinerary, I spent the entire drive considering my alternative options. 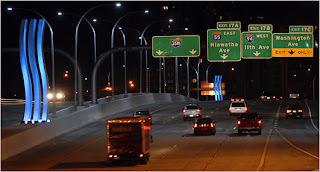 Having done well to get back on track I determined I wasn't willing to risk it and made the last-second decision to exit I-35W for Highway 280 to connect with I-94 to take us downtown. Highway 280 ultimately became the primary detour route until bridge reconstruction was completed on September 18, 2008. We arrived at our customary parking lot at approximately 6:10 pm and exited our minivan—yes, I said minivan … shut up—to the wailing chorus of sirens. But considering our proximity to the Hennepin County Medical Center, we didn't really give them a second thought. It wasn't until we were inside the Metrodome and we ran into my friend Pat in the concourse that we were informed of the horror playing out a mere mile away. Even then we couldn't fully grasp the enormous scope of the disaster. Our archaic cell phones at the time were incapable of allowing us to access images of the bridge while the photos we viewed on the phones of those around us were too small to paint an accurate picture of what was going on. It was amazing we were able to see what we did, considering the near blackout conditions in cell phone coverage in the area due to the massive amount of calls overloading the towers. Family members, including my brother-in-law, with knowledge of our plans that evening, and thinking the worst, frantically tried to reach us without success and causing them great strain. We, of course, could not reach them either until much later. The game itself began with a moment of silence for the victims and was played before a largely subdued audience which struggled to celebrate the successes witnessed in a game which lost its significance well before it began. I can still recall the morbid atmosphere in the building aided to some degree by the suspension of all in-game promotions creating an awkward silence between innings. Twins officials could have postponed the game but it was determined, and rightfully so, that sending 25,000 people immediately back out onto the streets of Minneapolis would be counterproductive to the efforts of rescue workers. As it was, the following day’s afternoon game against the Royals was rescheduled for August 31 as were the Target Field groundbreaking ceremonies to August 30. We stayed until the end of the game—as we always do—and meandered our way home via a series of alternate routes, still unable to wrap our heads around what had happened earlier that evening so close to where we had been. Once we were finally home after 11 p.m. we were astonished by what we saw when the television was turned on. It was beyond what our imagination had been capable of producing in our minds throughout the night. Since it reopened, I have yet to cross that bridge without considering the devastating impact the collapse had on the victims and their loved ones. I also never fail to wonder what if. What if even a slight alteration to our sequence of events had occurred?